Your lawn is an important part of your home's landscape. Maintained beautifully, it will give your house kerb appeal and add to your love of your home. 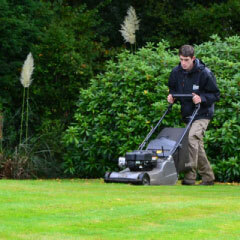 At Ricky Tyler Landscapes, we specialise in all the care that keeps your lawn looking beautiful and cared for. Many homeowners think that they can just mow their lawn and forget about it, but that isn't the case. A properly maintained lawn needs to be fed, kept free of weeds and moss, and prepared for the changing seasons through scarification, aeration, and reseeding. Of course, grass cutting is an essential part of your lawn care, with the cuttings either used as mulch or removed as green waste. Depending on the season, you will need to take care that you are cutting the grass at the right time and to the right length to keep the entire lawn healthy and green. 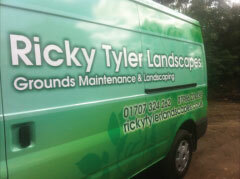 Why choose Ricky Tyler Landscapes? Whether you have a damaged lawn that needs to be regrown, an overgrown lawn that needs to be brought back under control, or just want to hand over the chore of maintaining your lawn to somebody else, Ricky Tyler Landscapes can help. We are ready to help with the lawn care for your Hertfordshire home. We can assess your lawn's unique needs and work with you to create a cost efficient maintenance plan that will keep your lawn looking its best at all times. We can provide lawn feeds, mosskillers, weedkillers, disease control, scarification, aeration, crass cutting, and mulching services as part of your lawn maintenance package. We're a trusted provider of lawn care across Hertfordshire, and we know we can help you make your home's lawn look its best. To find out more about what we offer, or to arrange an assessment of your lawn, give us a call today! Ricky Tyler Landscapes can provide gardening and grounds maintenance services including Lawn Care covering London, Essex, Hertfordshire, Northampton, Buckinginghamshire & Bedfordshire .